Godot Game Jam 2017 Entry. All assets produced within the duration of the Jam. There is always a beautiful scenery, just outside your house. The night sky, peppered with stars, grants wishes for those who await patiently for a shooting star. Control a basket tied to balloons to gather as many stars as possible without being popped - so that tonight will be a breathtaking starry night. * This is the Godot Game Jam build to be released in time with the deadline. Future adjustments to gameplay and mechanics may apply. Breathtaking visuals, music and atmosphere, perfect for relaxing and killing your time. 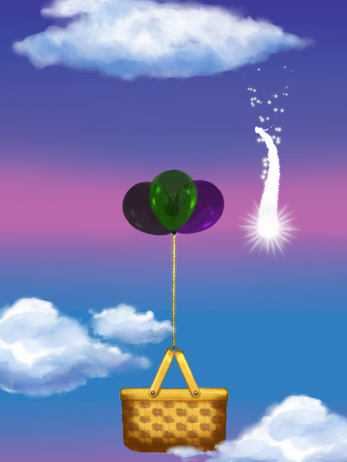 The idea of a floaty, dreamy game involving balloons is an old dream of ours. We've developed this idea for 3 years, but due to lack of skill, we could never make it become reality. But now, with enough experience, and support from our newest programmer Tumeo, we could finally make this project bloom. 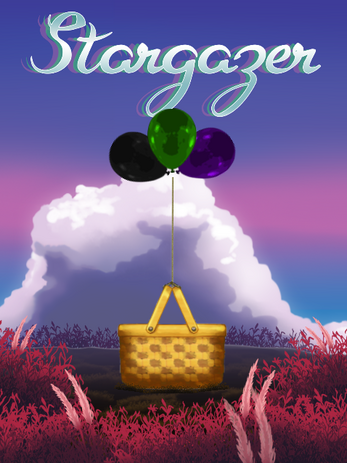 Fighting against the visual simplicity of similar games in the indie scene, Stargazer features lush visuals and art, all drawn by Gors and put into life by Tumeo and Vinicius. To top it off, the game's piano soundtrack and ambiance wrap the game nicely, in a pack of instant relaxation. It's a nighttime experience, but at any time, in your device. I have been posting the development progress of this game on my Twitter @spritergors and on Tumeo's Twitter @williamd1k0. Some extra footage of the game and insights are there (Twitter Moments with the game jam progress). I really liked the idea and execution. Graphics and music are really well done.